David Kinkaid will perform Irish Civil War Songs. 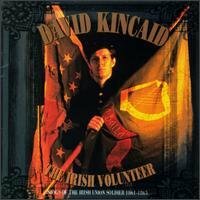 The Irish Volunteer is David Kincaid's first album of Civil War related Irish music. For years Kincaid has been the lead singer, lead guitarist, and leading songwriter for the American roots rock band, The Brandos. Kincaid, a long time Civil War enthusiast, assembled a collection of songs written during the Civil War era about Irish American soldiers fighting for the Union. Most of the songs only came with lyrics so Kincaid had to find traditional Irish music to set the lyrics to. Kincaid was devoted to historical accuracy in performing the songs, the pieces are performed only with instruments that would have been available to the people of the period. With the exception of "Free and Green" all the songs were written either before or during the Civil War. The songs praise the Irish immigrant volunteers who fought for the Union, most of the songs mention Thomas Francis Meagher, Michael Corcoran, and the famous Irish Brigade.